As we approach the midpoint of the fall semester, there are many exciting events that will highlight the extraordinary research, scholarship and creative activities of our faculty and students. First, the Institute for the Study of Sport, Society and Social Change, with support from our Campus Reading Program, will host its inaugural Student Research Fair on Oct. 15. As a former student-athlete and women’s basketball coach myself, I know the interrelatedness that provides interdisciplinary possibilities for the exploration of ideas. Additionally, this month we continue our University Scholar Series on Oct. 24 with a lecture by Nursing Professor Deepika Goyal, who will share new findings on postpartum depression in Asian American women. On Nov. 2, we will celebrate the scholarly works of dozens of faculty members at the Annual Author and Artist Awards. Read more in this newsletter about these and other recent events that elevate our reputation and our scholarly work. I am pleased to share that we have made considerable progress toward implementing our new Research, Scholarship and Creative Activities Reassigned Time program and will do so officially in January 2019. This program represents our best efforts to align the scholarly expectations of tenure-track faculty with the expectations of the Academy; to increase recognition that students are, and will be, prepared successfully by successful teacher-scholars; and to honor our evolving relationship with our surrounding community and Silicon Valley. Eligible and interested tenured and tenure-track faculty submitted their applications to their Dean’s Office at the end of September. I look forward to receiving college submissions later this month and announcing selected candidates for our first five-year cycle in November. I also would like to note that we have 43 faculty members who received tenure and/or promotion this year based on their dedicated teaching, exemplary RSCA work and strong record of service. This fall we invited them to share some notes about themselves for profile stories on the Academic Spotlight blog. You can read the first of these profiles online now. Look for more throughout this semester. I continue to look forward to our work together. Department of Film and Theatre Lecturer Kirsten Brandt directed the African-American Shakespeare Company’s production of Richard III in July at the Taube Atrium Theatre in San Francisco. Before becoming a freelance director, she served as artistic director of San Diego’s Sledgehammer Theatre for seven years. School of Management Associate Professor Gretchen Vogelgesang Lester published “Autocratic Leaders and Authoritarian Followers Revisited: a Review and Agenda for the Future” in The Leadership Quarterly, an article that discusses why people elect leaders who restrict freedom. An August article in The Guardian about “skim reading” in the digital age and the profound societal effects of that trend referenced the research of iSchool Professor Ziming Liu. Department of Physics and Astronomy Assistant Professor Thomas Madura spearheaded a STEM camp in Kalamazoo, Mich., for blind and visually impaired students from around the state. The camp was sponsored by the Bureau of Services for Blind Persons (BSBP), a program that helps students transition from high school to postsecondary education or employment. Department of Economics Assistant Professor Raymond March posted an article on The Independent Institute’s blog titled “If Telemedicine Is Underachieving, Government Is to Blame.” “An unfortunate consequence of any regulation is that it restricts the number of alternative products and services available to consumers,” March wrote. Communications Studies Professor Matthew Spangler was interviewed about SJSU’s Communications Studies program by MastersinCommunications.com in August. The site’s mission is to help students make informed decisions when planning their academic and professional goals. Department of Nutrition, Food Science and Packaging Chair Ashwini Wagle gave the keynote address at Silicon Valley’s Rise Against Hunger event in July. An international hunger relief organization, Rise Against Hunger aims to end hunger by 2030 and operates meal packaging locations in 25 cities throughout the U.S. and at five international locations. “When you package a meal with Rise Against Hunger, you are simultaneously empowering people to become nourished and live a healthy life,” Wagle said. KTVU interviewed School of Management Professor Robert Chapman Wood about the announced closing of all Orchard Supply Hardware stores. “Somebody decided that OSH was a small problem in a company with really big problems. And so they gotta close it,” Wood said. We are only in the second month of the spring semester, but this term has already proven to be busy! On February 9, the Strategic Planning Steering Committee provided an update on our process to date and presented draft goals that were developed from your input during the fall semester. Following our presentation, we held a campus conversation and lunch to discuss our next steps. I encourage you to view the draft goals at the Strategic Planning website. On the site, you can also provide input to the task forces that will be working to define our desired outcomes for each focus area and create strategies for accomplishing them. Several of the goals focus on our mission of providing excellent educational and academic opportunities. We already have a thriving research, scholarship and creative activities (RSCA) enterprise. According to the most recent SJSU Research Foundation Annual Report, we received $58 million in revenues from RSCA endeavors, with an active grants portfolio of $259 million. In fact, the Chancellor’s Office recently selected SJSU and the Mineta Transportation Institute to lead a CSU research consortium focused on solving transit issues in the state. We also have many more faculty and students working together on numerous scholarly and creative activities – just take a look at the list of recent publications from our Annual Author and Artist Awards or the list of upcoming events at the Hammer Theatre. Our RSCA activities rival that of many nationally ranked universities. However, faculty can feel challenged when seeking a balance between their teaching load and their RSCA agendas. We are working with colleagues to develop a sustainable model that will allow us to balance teaching and RSCA pursuits. We have a consultant who has already visited and will be working with us throughout the spring. Joan Ficke, the former dean of the Graduate School at Montclair State University, will provide guidance as we develop a plan. She was instrumentally involved in transitioning her institution to providing a better alignment between RSCA, teaching and service. Providing an atmosphere where faculty and students can readily engage in RSCA also means celebrating our achievements. I am pleased to support the University Scholar Series that offers an opportunity to learn about the unique and inspiring RSCA conducted by SJSU faculty. This month, we kick off the spring lectures on Feb. 21. Professor Anand Vaidya, director of the Humanities and the Arts Center for Comparative Philosophy, will use his talk to share recent research into Eastern philosophies and critical thinking. Learn more about the upcoming series in a story below. Join us for the lecture and lunch, from noon to 1 p.m. in MLK 225/229. For more details, visit the event page. Later this semester on April 4, the Celebration of Research offers an opportunity to acknowledge student researchers along with our Early Career Investigator Award winners for 2017-18, Ehsan Khatami and Dave Schuster, whose accomplishments are described in a story below. As you will learn in this month’s newsletter, our RSCA endeavors are innovative and relevant. A few recent projects run the gamut from understanding Silicon Valley culture to studying how sports can lead to social change to determining just how the flu virus is spread. I would also like to remind staff members that we are accepting applications for the second round of staff professional development grants, with proposals due March 19. The application is open to any staff members who did not receive a grant during the first round of proposals last fall. Find more details online. 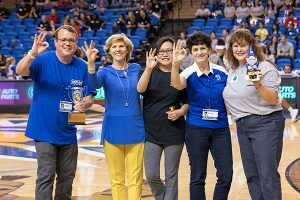 Provost and Senior Vice President for Academic Affairs Andy Feinstein, Athletics Director Marie Tuite, Director of Strategy, Planning and Business Services for IT Kara Lee, President Mary Papazian and Interim Vice President for Student Affairs Sharon Willey show their Spartan spirit February 10 at a women’s basketball game. Before we move onto this month’s stories, I want to thank everyone who attended the Third Annual Interdivisional Competition on Feb. 10. Academic Affairs had more than 270 RSVPs from faculty, staff members and their families with our section of the stands full on game day. We cheered on the Spartans Women’s Basketball team while also competing in some fun activities such as a free throw competition, a relay race and the VP tricycle race. I am especially proud that Academic Affairs brought home the trophy again!